~ Being a collection of divers historical & museum topics. Swords, armor, and dueling have always been more fascinating than foils, plastrons, and bouting. For example, you probably have a general idea of swords, armor, and dueling, but aren’t quite sure what the latter three are. It’s understandable. There has always been more drama, and thus interest, in real combat than combat training. Because of that, it can be difficult for those of us interested in fencing training to learn about historic equipment. To remedy that, I’ve assembled this visual and textual chronology of fencing equipment used from seventeenth century through the late twentieth century. It does not cover the production, trade, or use of fencing equipment, only an object’s existence and form. Also, it should be noted that the following is a work in progress and does not claim to be exhaustive or complete. Still, it’s a heck of a lot more than what’s out there right now. 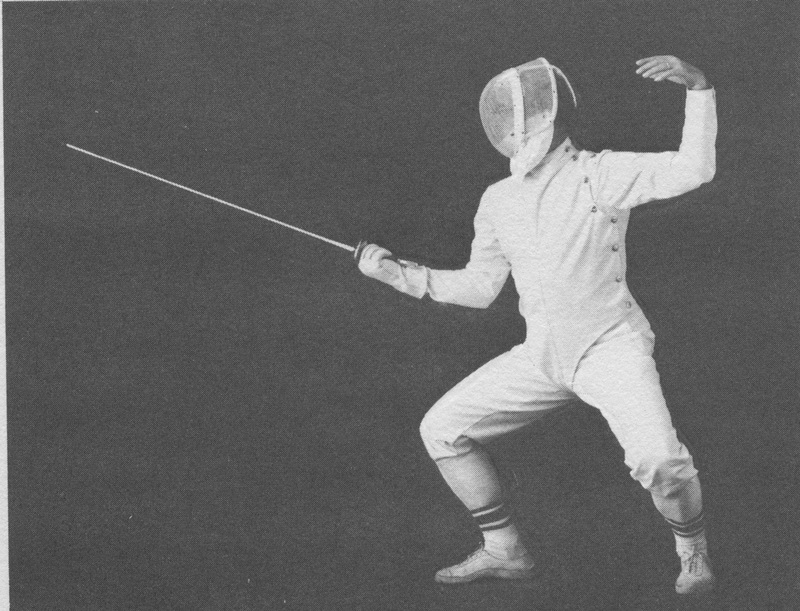 For the sake of clarity, I’m using the term fencing here to mean bouting with blunted, rebated, or foiled (read safety) weapons while wearing protective, as opposed to defensive, gear. For more fencing history check out our Fencing Posts. 1641-1657. Pair of rebated rapiers. L’ESCRIME / Bien que l’un semble plus adret … Droit dans le neuviesme bouton., Claudine Bouzonnet-Stella, after Jacques Stella. Source. 1648-1702. Foils with round disc guard and reinforced quillons. 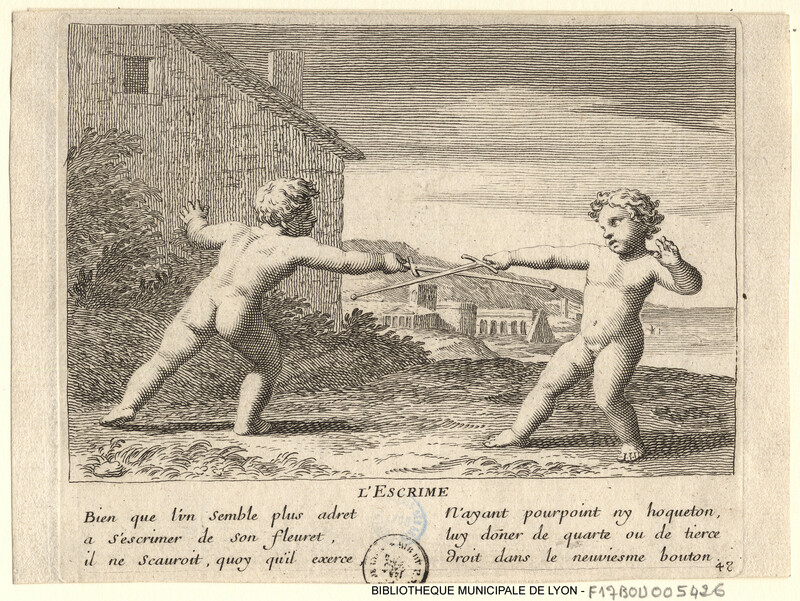 Fencing scene, Marcellus Laroon II. Copyright The British Museum. 1652- 1718. Has a plastron (protective jacket), the single fencing shoe or slipper on the forefoot, and carries a basket-hilted foil. Le Maistre d’Armes, by Nicholas Bonnart, 1652-1718. Copyright Trustees of the British Museum. 1686. 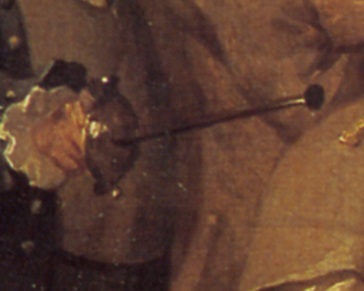 In the lower left corner there are two blunted (also called rebated or foiled) rapiers and what appears to be a fencing mask (based on its proximity to the rapiers). Gioventù (Youth), Giuseppe Maria Mitelli. Source. 1725. 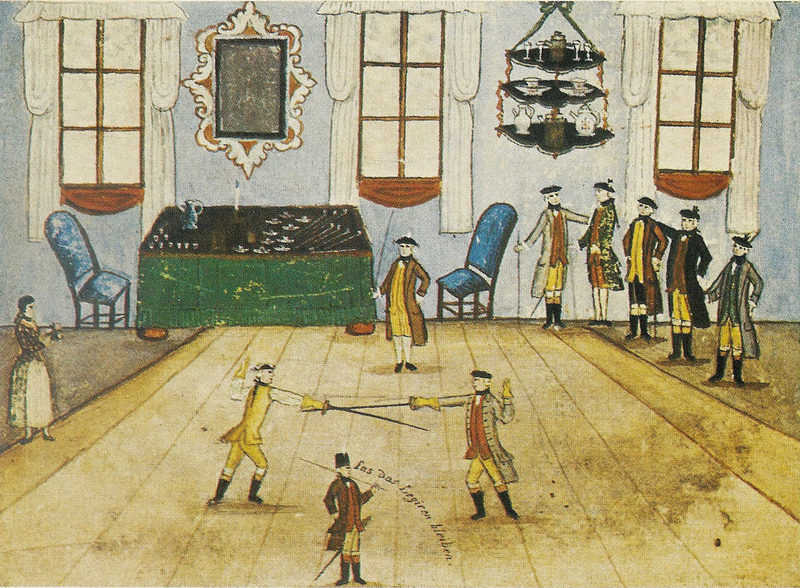 A fencing salon equipped with round or ovoid foils with quillons, fencing slippers, and a master’s plastron. I have no idea what the fencer on the bench is wearing on his head. Is it a mask or a cap, or something else all together? Der Fechtende Student, Johann Georg Puschner. Wikimedia. 1730-1760. Two basket-hilted foils and a round guard with pas d’âne and quillons. 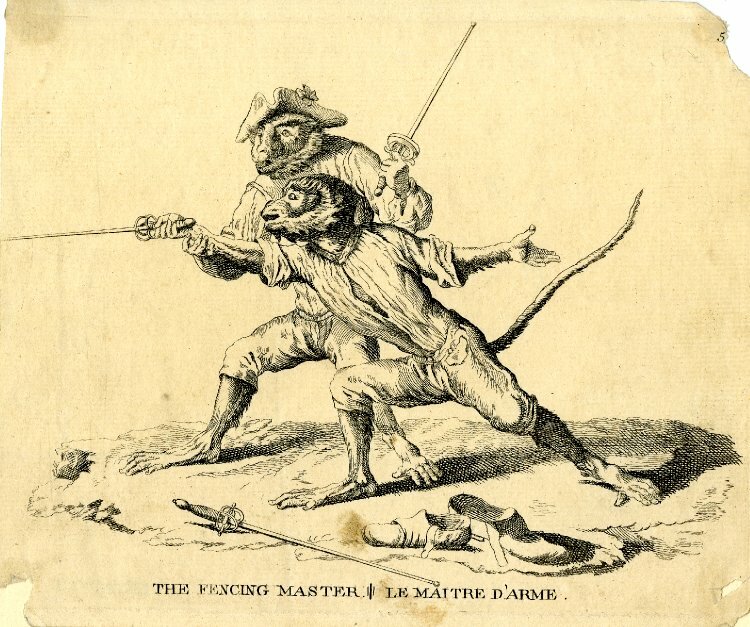 The Fencing Master/Le Maitre d’Arme, Jean Baptiste Guélard. Copyright Trustees of the British Museum. 1732-33. A fencing master with his plastron and ovoid foil guard with (integral?) quillons (See detail below). 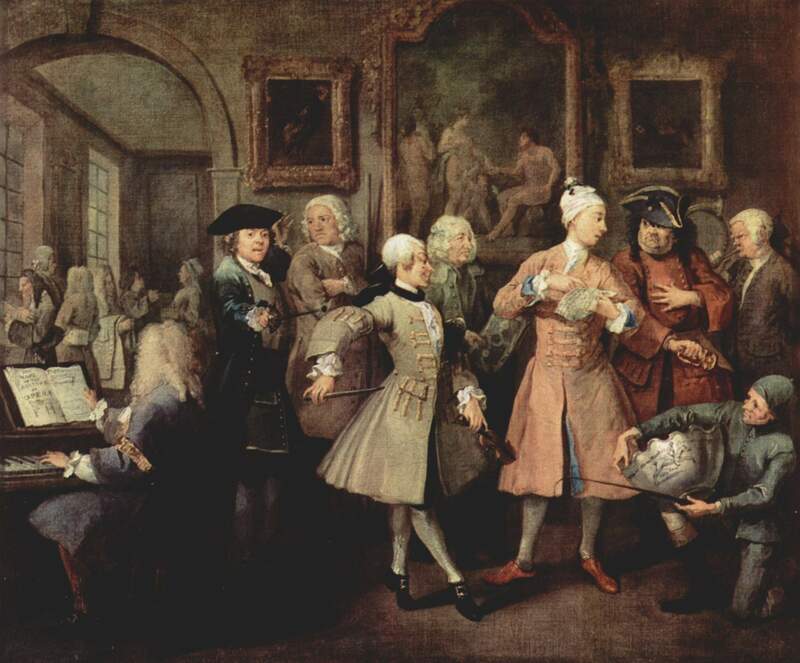 Rake’s Progress, William Hogarth. Wikimedia. 1739. Round or ovoid foil guards with quillons. 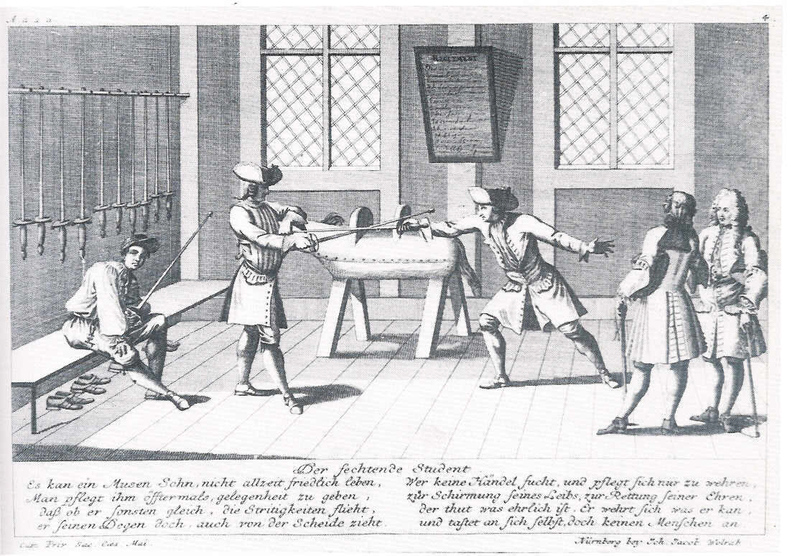 Anfangsgruende der Fechtkunst Nebst Einer Vorrede von dem Nutzen der Fechtkunst un den Vorzuegen Dieser Anweisung (Elements of the Art of Fencing Together With a Prologue Regarding the Benefits of the Art of Fencing and the Merits of These Instructions), Anthon Freiderich Kahn. Source. 1764. A dated foil, with ovoid guard and integral quillons. 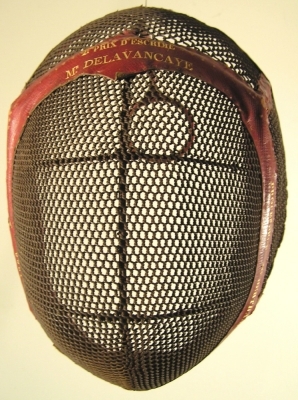 From the collection of the National Fencing Museum (Great Britain). 1765. L – ovoid foil guard. R – basket hilt foil. 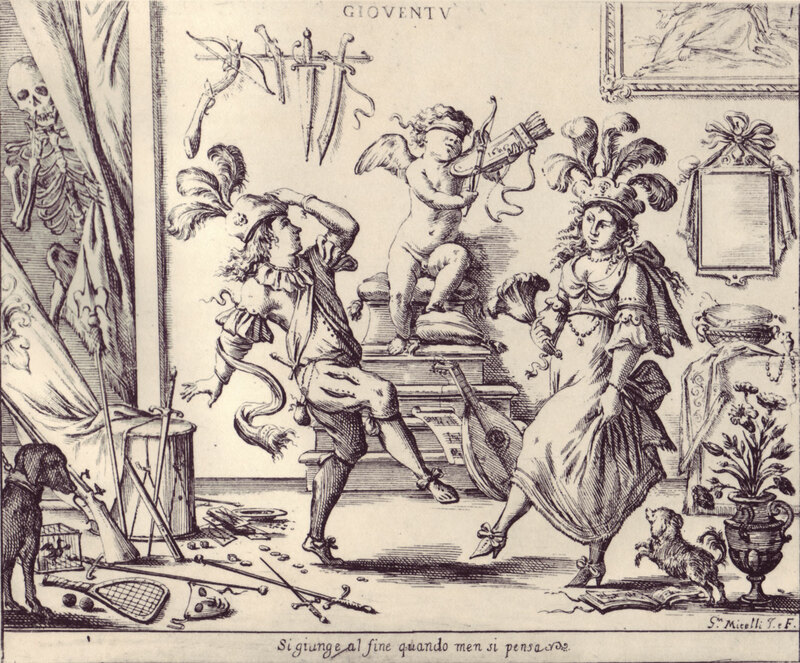 Detail from “Furbisher” plate IV, Diderot’s Encylclopedia. 1765. Basket hilt (with a figure-8?) foil, heavily padded glove, plastron, fencing slipper, and fencing mask (notice how the masks are always smiling). Detail from “Fencing,” Plate XV, Diderot’s Encyclopedia. C. 1770. 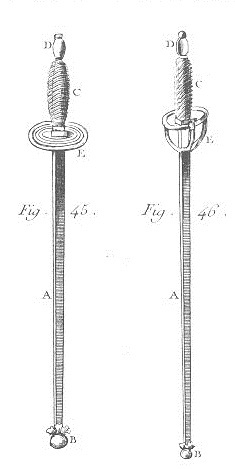 Earliest known extant English foil with cup hilt, and reinforced quillons, made by Samuel Harvey of Birmingham. From the collection of the National Fencing Museum. 1771. Round foils with reinforced quillons, master is wearing a plastron, and all of the fencers shown are wearing sleeved waistcoats and no other protective equipment. 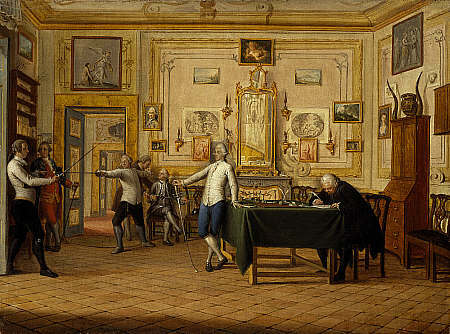 Kenneth Mackenzie, 1st Earl of Seaforth (1744 – 1781) at home in Naples, Pietro Farbis. Collection of the National Galleries of Scotland. 1773. Round guard foils and a fencing mask (leather under wire?). The D—— of […]– playing at foils with her favorite lap dog Mungo after expending near £10000 to make him a———-*, William Austin. Lewis Walpole Library. 1773. Foils and gloves. Fencing training of Göttingen students in an appartment, Stammbuch Hempel, Unknown. Source. 1780. While the foil isn’t detailed enough to be useful, it’s interesting to note the fencer is wearing breeches, a sleeved waistcoat, and a(n inconveniently) large hat, but doesn’t seem to have any special protective gear on. 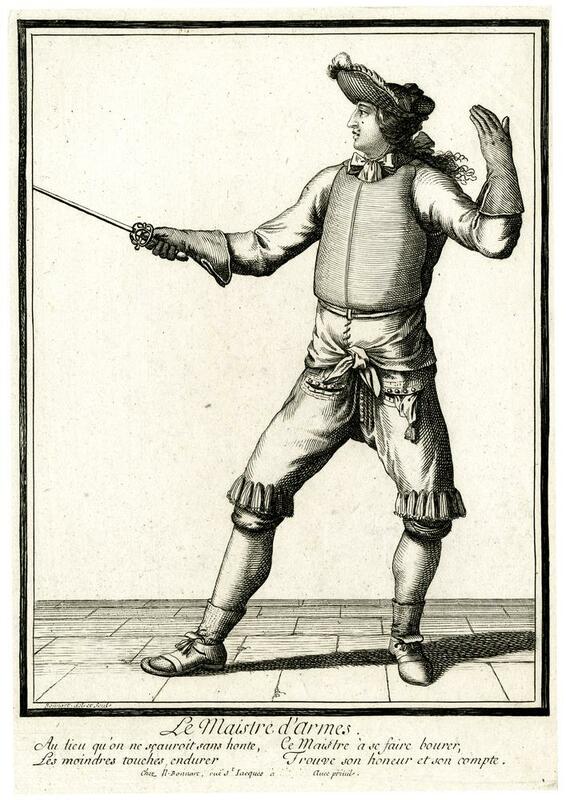 It is common throughout the eighteenth century to depict fencers in small clothes (with sleeved waistcoats) or in frock coats. 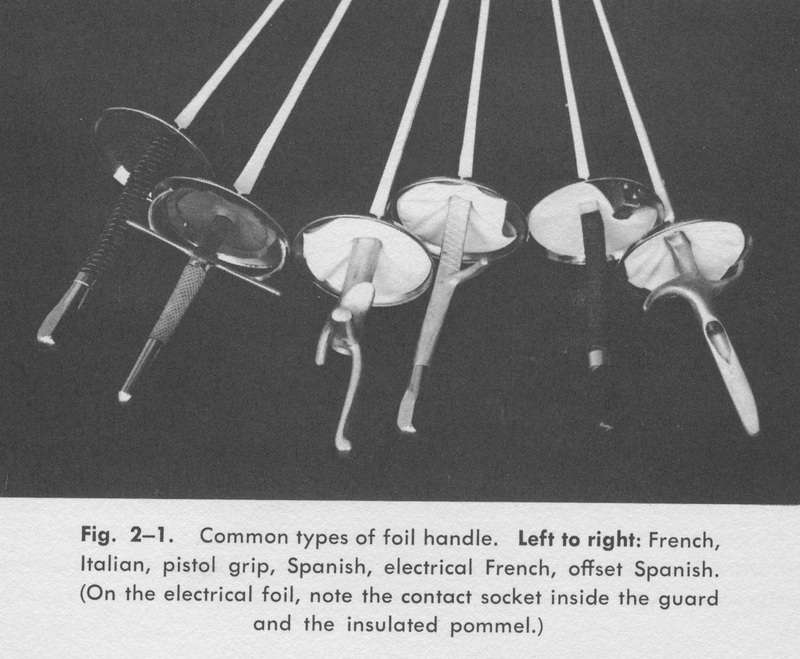 From Theory and Practice of Fencing, John McArthur. 1782. Glove, foils, mask with ties, and fencing slipper (?). From Traite en raccourci sur l’art des armes, Alexandre Picard Bremond. Source. 1787-1789. 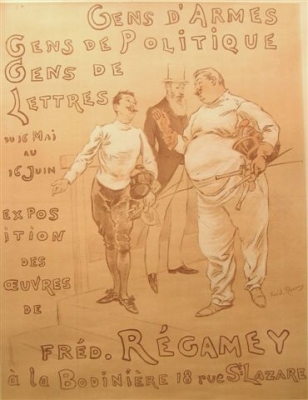 Ovoid guard foils, padded, gloves, fencing slippers, and the fencer on the left is wearing only breeches and a sleeved waistcoat. The fencer on the right isn’t a woman, it’s a cross-dressing man. The most interesting aspect of this is the mask at the extreme lower left hand corner. It had an over-head clip, not ties. 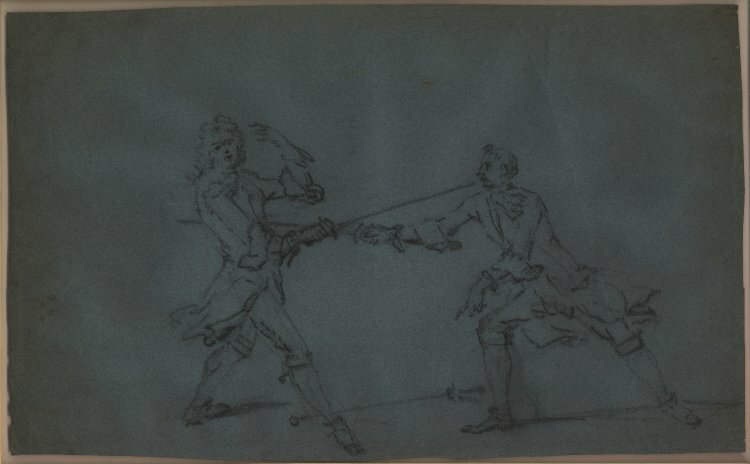 The Fencing-Match between the Chevalier de Saint-George and the Chevalier d’Éon, Alexandre-Auguste Robineau. Royal Collection © Her Majesty Queen Elizabeth II. 1787. Disc-guard foils, heavily padded gloves, our first wire masks (with ties), & fencing slippers. 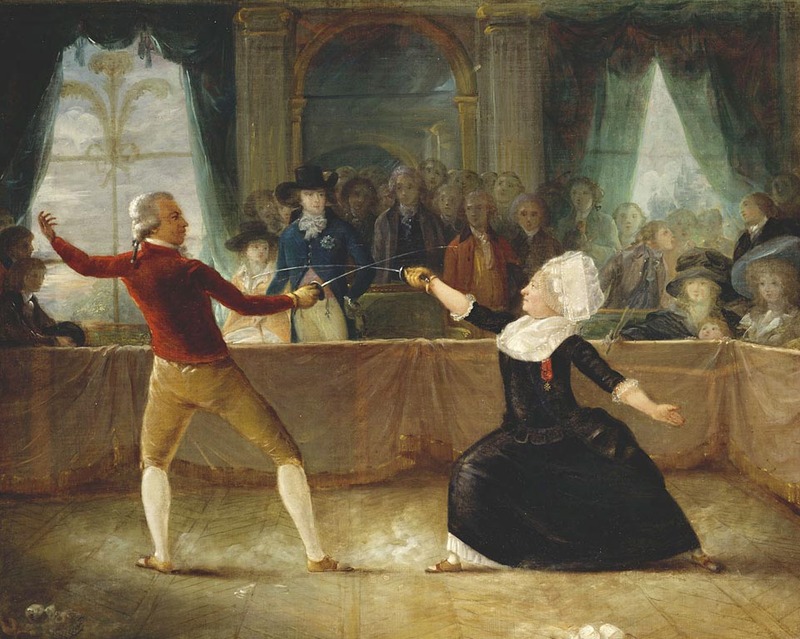 Henry Angelo, who is standing to the right of the right fencer, is wearing both a master’s plastron and a white, side-buttoned fencing jacket.The famous fencer the Chevalier Saint-George‘s portrait, foils, and fencing shoes (both of them?) are displayed on the right wall. You can see a 1791 version of the same print here (the zoom function is very useful). I Shall Conquer This”, Thomas Rowlandson. Wikimedia. Pre-1787. Padded glove and open-work figure-8 foil guard. Monsieur De St. George, William Ward, after Mather Brown. Source. 1788. Solid figure eight foils, round guard foils, well-padded gloves, wire masks (not worn, but hanging on the rail behind), and oversize fencing shoes (on front feet only?). 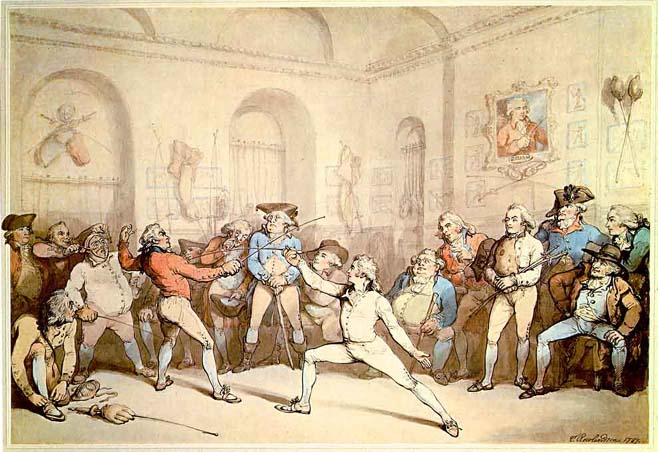 A Fencing Match, Thomas Rowlandson. Metropolitan Museum of Art. 1789. 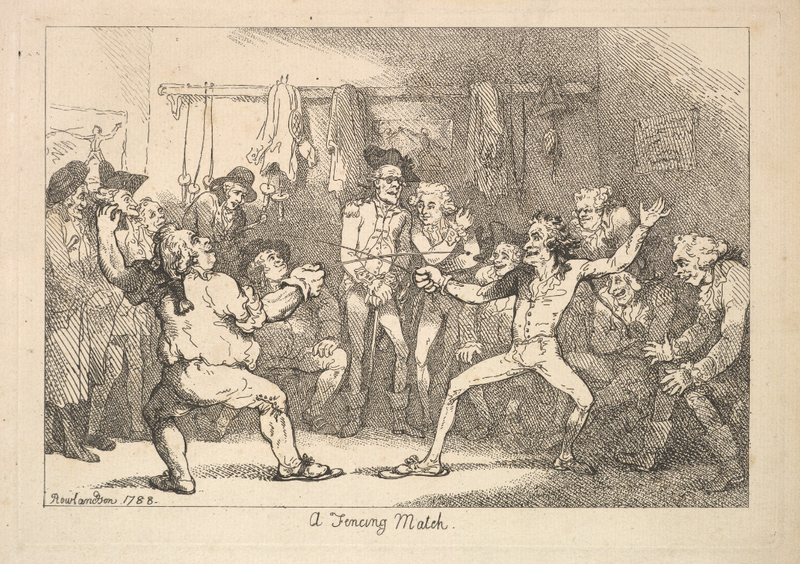 While the foils are generic, this print suggest that by the late 1780s wire masks were becoming commonly associated with fencing. 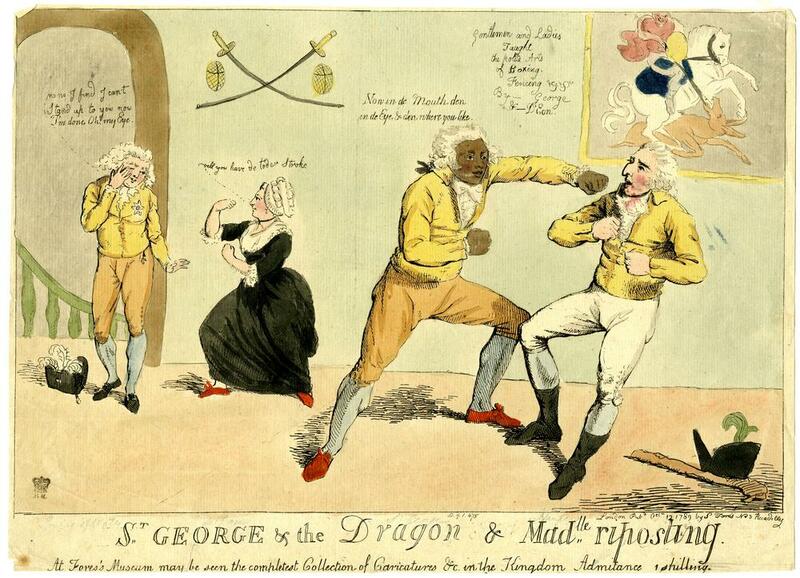 St George & the Dragon & Madlle riposting, Isaac Cruikshank. Copyright Trustees of the British Museum. C. 1790. White fencing jacket with black collar (also notice the button closures are the reverse of normal men’s wear to prevent blades from easily entering at the button line), padded glove, and foil. While the foil could have a brass guard, could hilt be leather, like this one. Henry Angelo, Mather Brown. Collection of the National Portrait Gallery. 1814. 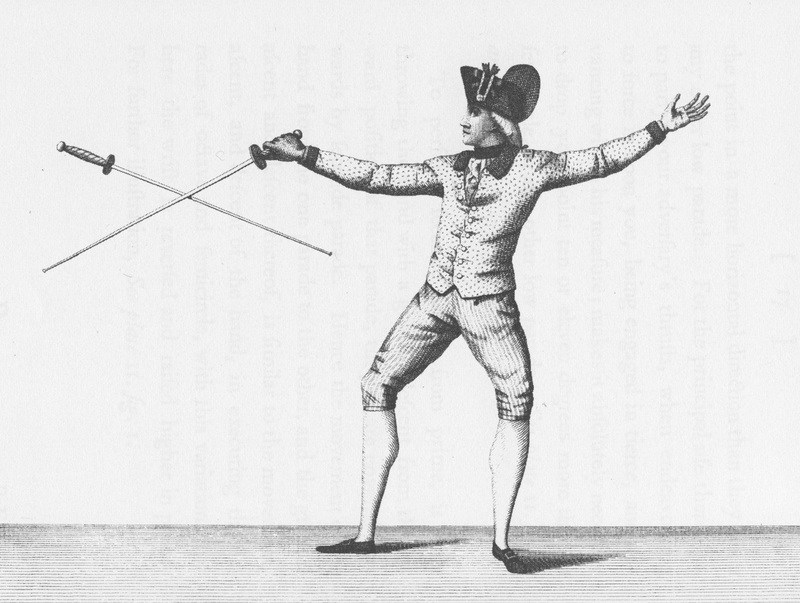 Round or ovoid foil guards with quillons, tied masks, a fencing slipper on front foot of fencer in red coat, and a master’s plastron worn by the fencer on the right. 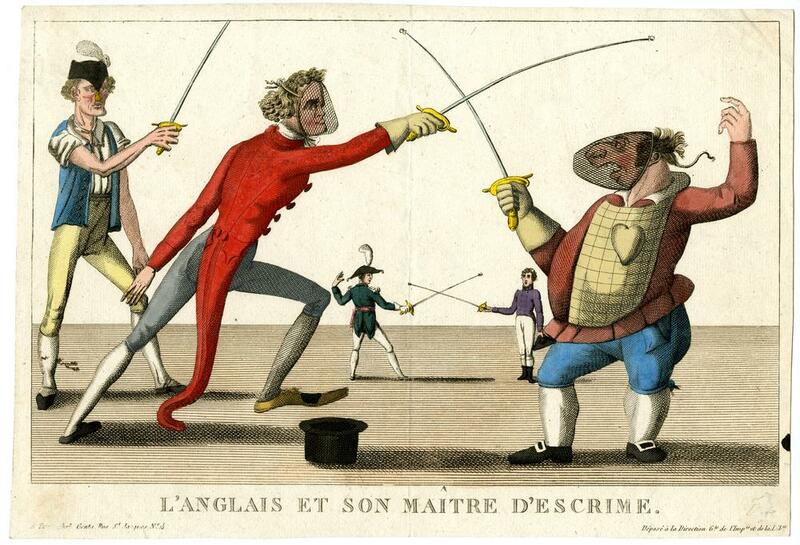 L’Anglais et son maître d’escrime, attributed to Jean Baptiste Genty. Copyright Trustees of the British Museum. 1818. Open work figure-8 foils and fencers in sleeved waistcoats. 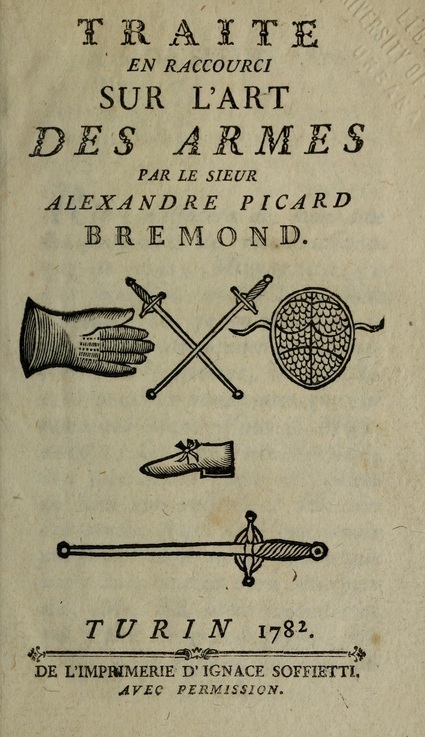 Plate from Traité de l’art des armes, a l’usage des professeurs et des amateurs, Texier la BOËSSIÈRE the younger. 1821. Shows buttoned white fencing jackets, padded gloves, masks with head clips (not ties), and fencing slippers. Fencing. 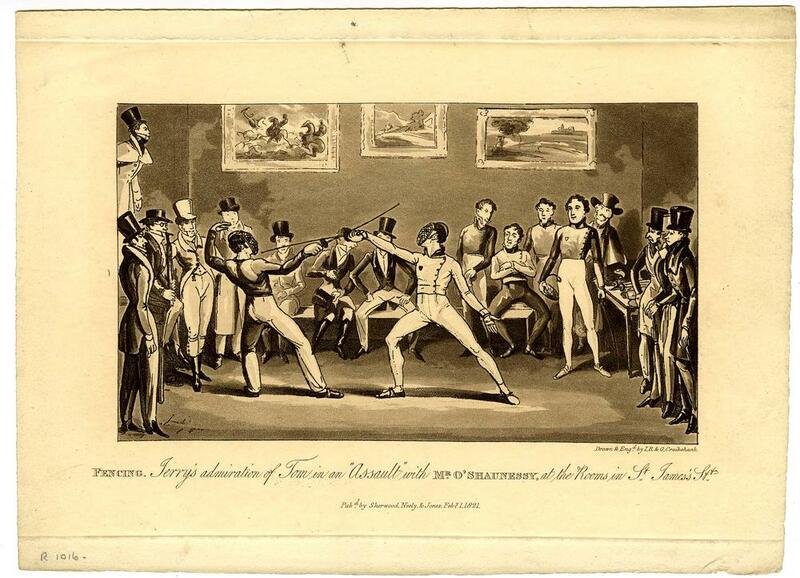 Jerry’s admiration of Tom in an “assault” with Mr O’Shaunessy, at his rooms in St James’s St., George Cruikshank. Copyright Trustees of the British Museum. C. 1831. White fencing uniforms, masks with clips, figure 8 foils, red belts, and fencing slippers. Brevet de Pointe, Dembour Metz. Brown University Library. 1830-70. Solingen foils made by Friedrich Hörster, with steel decorative pierced guards. From the collection of the National Fencing Museum. 1830-75. Brass disc foils with blades stamped FH (Friedrich Horster). From the collection of the National Fencing Museum. 1866. Mask with unusually small hexagonal mesh specially made for Prof. Bertrand to give as a prize at the Petit College de Rollin in Paris. From the collection of the National Fencing Museum. 1880s. Buttoned fencing jackets, fencing slippers, masks, figure-8 guard foils, and padded gloves. 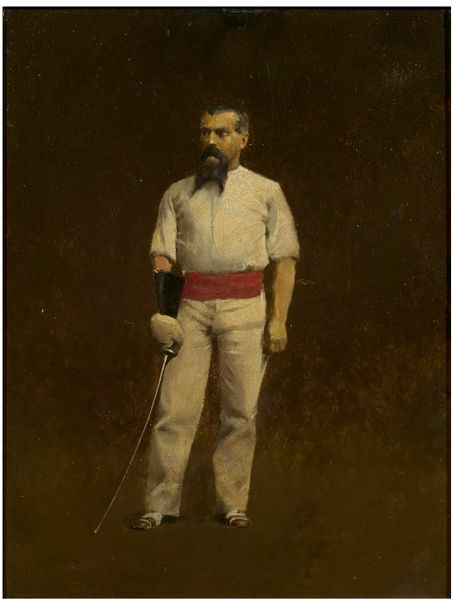 Edmund Quinn Fencing, Circle of Thomas Eakins. The Metropolitan Museum of Art. c. 1883. Large padded glove with black cuff, red belt, fencing slippers, and foil. 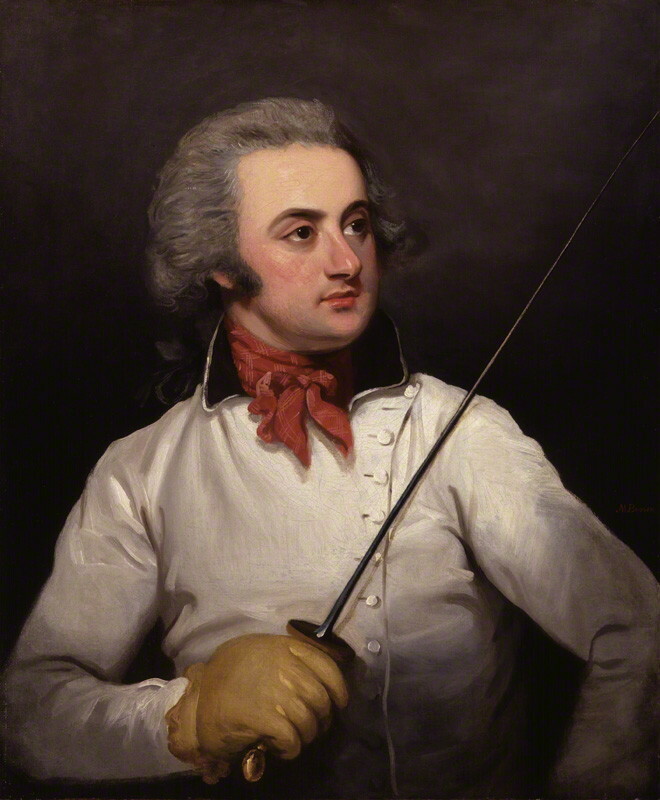 Sir Richard Burton dressed for fencing, Albert Letchford. Collection of the Victoria & Albert Museum. 1890. 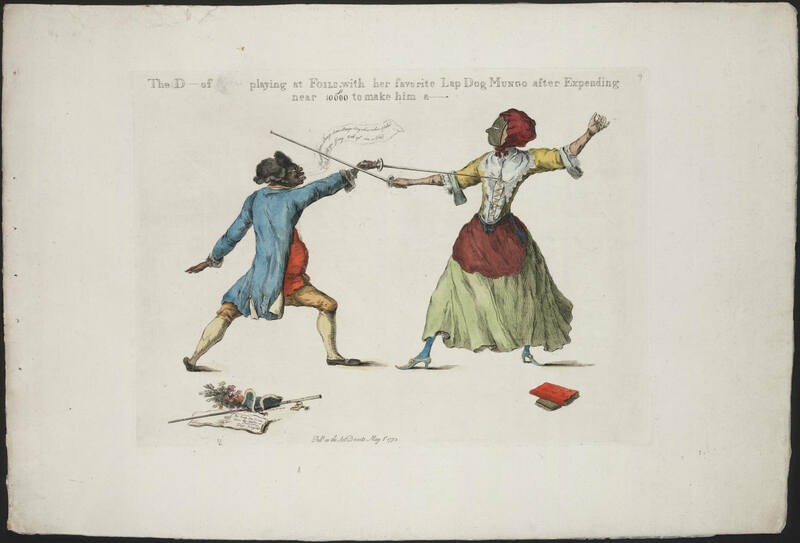 Description of various foil types, men in white fencing jackets with belts, and female fencer in black fencing dress. From Descriptive Catalogue and Price-list of Sportsmen’s Supplies, Including … Everything for Forest, Field, and Stream, Henry C. Squires. 1890. Description of various foil types. From Descriptive Catalogue and Price-list of Sportsmen’s Supplies, Including … Everything for Forest, Field, and Stream, Henry C. Squires. 1890. Various wire masks, gloves, red belt, slippers, plastron, and jackets. From Descriptive Catalogue and Price-list of Sportsmen’s Supplies, Including … Everything for Forest, Field, and Stream, Henry C. Squires. 1893. Various foil and blade types and red belt. From Catalogue and Price List Base Ball Players Supplies, Fishing Tackle and Sporting Goods in General, H.H. Kiffe Company. 1893. Wire masks, glove with black cuff, plastron, and fencing slippers. Notice, there are no fencing jackets listed. From Catalogue and Price List Base Ball Players Supplies, Fishing Tackle and Sporting Goods in General, H.H. Kiffe Company. 1895. 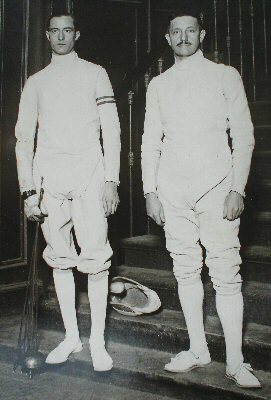 Showing black breeches and white pants, fencing slippers (fencer on right), and wire masks. From the collection of the National Fencing Museum. C. 1900. His equipment is right out of the catalogs above (for example, his is mask #3 with head protector listed in the Kiffe catalogue). By the way, that foil doesn’t look safe. “The Fencing Master,” Gary Melchers. Collection of the Detroit Institute of Arts. 1902. Description of foils. 1902 Sears Roebuck Catalogue, p. 341. 1920s. Buttoned jacket, black skirt, black glove, wire mask, and round guard foil with urn pommel. From the collection of the National Fencing Museum. 1926. Buttoned jackets, breeches, fencing slippers, padded wire mask, and a bunch of foils and epees. From the collection of the National Fencing Museum. 1930s. 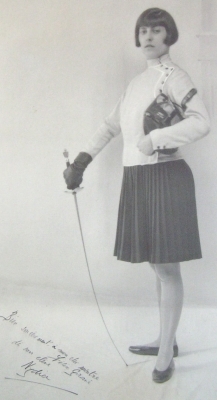 Round foil guard with conical pommel, buttoned jacket, black skirt, black glove, and padded wire mask. Portrait of E. Grant Robinson, Harold Lisle. From the collection of the National Fencing Museum. 1920s. French-grip round guard foil, buttoned jacket, black pants, and glove. Image of Aldo Nadi. C. 1962. Various foil grip types. From Fencing, Hugo Castello & James Castello, The Ronald Press Company, New York. C. 1962. Padded wire mask, snap-closure jacket, breeches, and roud guard foil with French grip. 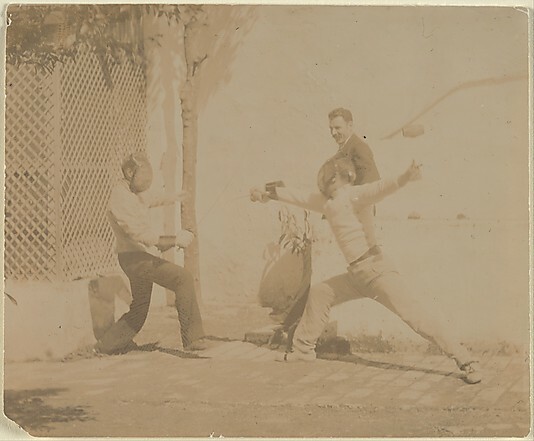 From Fencing, Hugo Castello & James Castello, The Ronald Press Company, New York. Picking up on your opening points, that while people may find it easier to visualise martial arms and armour more than they can the equipment used in fencing that what they most easily visualise in the practice of the use of arms, are the sportive aspects from fencing, rather than how those real weapons, would have actually been used. That or the other misinformation generally perpetuated through the cinematic stereotypes. I find that an interesting contrast. A nice collection of references thanks for sharing. Though I wonder why you chose to start in the mid 17th century, when, as you say most people think of a sword would think of something of the medieval type, you didn’t show training weapons of the earlier periods, though they are even less frequent there are images and actual surviving examples of the so called federschwert, rebated rapiers, as well as some from the later middle ages, one could even go so far as to the mentions in the Kings mirror and earlier Vegitius on training and possible surviving Roman Iron age wooden training weapons. Thanks for taking the time to look over the page, to comment, and for the kind words. There are a few reasons I chose to start with the 17th century. First, I’m not trying to create a complete history of training & practice equipment. While I have an interest in earlier periods, my focus is on the early modern and modern periods. Secondly, it seems to me there has already been a great deal of research done on earlier training equipment. Just quickly, there’s the ARMA, Historical Fencing Association, HROARR, Fencing Classics, EHCG (as you know), among others. Fortunately for the rest of us, these organizations share much of their work online for free. That said, most of what I’ve found out there, both online and in print, seems to either stop at the 17th century or gloss over the later periods. It strikes me that available material culture studies of early modern training equipment is lacking. I’ve found things like this post, but it lacks any detail or true academic inquiry. Which is ok, because it wasn’t designed to be anything other than a quick overview. It just seems like everything is a quick overview (or a lot of undocumented assumptions & hearsay). This page is my attempt to fill that hole, even a little bit. It’s interesting that you felt I started with what seemed to be a medieval-based comparison. That wasn’t intentional. I chose those nouns specifically because any sword-centered conversation I’ve had with non-history or non-fencing folks tend to always come back to swords, armor, and dueling. I believe they do that because they’re trying to connect new information to what they already know (even if in doing so they unknowingly mix various time periods). It seemed like a handy, concrete way to begin. I hope I’ve answered your questions. Thanks for the response, I hope it was clear that none of my observations and questions were intended as criticisms. It seems from the HEMA side of things that there is more continuity in practice and understanding of the overall arch of the use of arms. which I can see as only being a good thing as each generation in truth built on what had gone before. Though even in HEMA people often tend to stay within broad periods, or occasionally favour more than one period divided by a good chunk of time. Some, myself included like to take in the whole view or as much as we can. Hence my interest in seeing all aspects relating to the subject from the broad view, in one place. It was this opening line that lead to that conclusion and from my own experience.. If one says swords to most people are are likely to think along the lines of a medieval type broad sword. maybe a two hander or perhaps a katana. If you say armour, they are likely to think of a knight in shining armour. I have found that with most people they wouldn’t think of anything from the period you cover, Hence my point about a medieval slant on the collective imagination. Only with duelling might they consider the same time frame you cover, then they think on some strange mash up of Musketeers, 18th Century gentlemen in powdered wigs and maybe a bit of a pistol duel thrown in. Yet if one talks about Fighting with swords, time and again one hears, “What? like fencing?”, though how the image of modern fencing and medieval weapons and armour sit in the same space is hard for me to think on. Of course that is followed on opinions on the superiority of Japanese fighting methods and the mighty Japanese sword but that is another subject! 😉 This is from dealing with hundreds of “normal” people a year on the subject for over 20 years. I didn’t take your comments as criticism at all. Rather, I appreciate your perspective. Thanks for giving me a few things to think on. Didn’t think I had but I have learnt from interacting on the internet that it is better to make sure, just to be on the safe side, things that face to face would not cause an eye blink can turn in to something else on line. The fencer on the bench in “Der Fechtende Student” is wearing a jockey cap on his head. Informal wear…kind of a precursor to wearing a baseball cap with the bill flipped up. Worn for playing cricket, riding horses (naturally), just being an eighteenth-cnetury hipster, and now (apparently) for fencing? Popular from about 1730 onward…perhaps even earlier. Hope this helps. – Bt.W. I can see that. The bill in this image is pointed. Have you seen jockey caps with a similar cut? Thanks for sharing your thoughts. Hope all is well.